In college, I was chatting with my friend online. I forget what the context was, but perhaps it was something like “I’m not really tired, but it is getting late. I mine as well go to bed now.” My friend responded “Do you mean MIGHT as well?” As most word endings are eaten when speaking (in Philly), “mine” and “might” sound awfully close. I had been living my whole 21 years thinking the phrase was “mine as well” instead of “might as well”. Mind blowing. I would like to bring to your attention the following, delicate matter. As you might remember, a subtle issue pertaining the English grammar was timidly raised by my humble person yesterday. Let me remind you that phrase in question was: “let alone”. Doubtlessly, as you pointed out, the primary meaning of the collocation is (after some random page from google): let alone: let someone or something alone and leave someone or something alone; leave someone or something be to avoid touching, bothering, or communicating with someone or something. Now, let me prove beyond all doubt that the usage proposed in your doctoral thesis (“yet alone”) is incorrect. For the proof I shall again use a randomly chosen google search result, namely this: http://forum.wordreference.com/showthread.php?t=2083682. Clearly, the commotion related to the correct usage of this phrase is not a singular case. Apparently a children’s book author was equally nonplussed, which might of slight consolation for you. Finally, I would like to apologize to my English teacher, Małgorzata K*. Contrary to what I suggested yesterday, stating that she was ‘Polish’, I appreciate her work. Taking into account that, at that time, I was primarily interested in kicking ball with my friends (i.e. playing football), I think it is a genuine miracle that I can construct a valid English sentence. On a similar note, I feel obliged to apologize to my other teacher, Simon D*, who is actually English. As a punishment, I decided to write this letter. I trust this is the punishment they would see fit, as they often did in the past. Summarizing, I hope that, however the situation might be uncomfortable for both of us, your command of the English language as well as the quality of your doctoral thesis has greatly benefited. I would like to point out that it was not my intention to belittle, slight or offend you in any way. Hoping that my constructive criticism shall not adversarially affect our, so far, amicable relationship, I wish you a nice weekend. When we moved to our house on Kottler Drive, my dad decided to plant a tree for each of the kids. 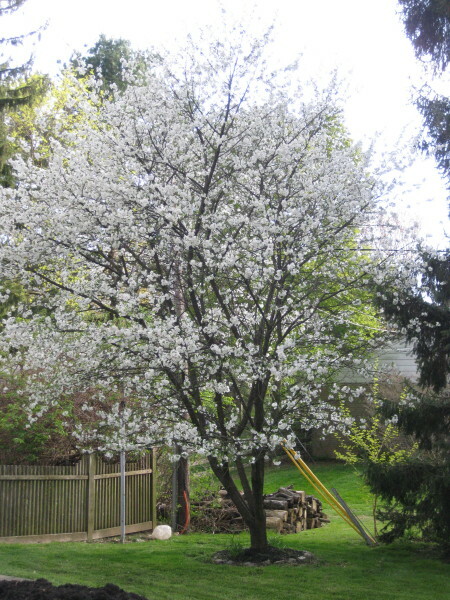 The tree that he planted for me was a cherry tree on the side of the house (in front of our fence). My sisters’ and brother’s trees have since died, but my tree is still going strong! Last week, my dad sent me this photo of the cherry tree in bloom! Hurray for spring! The Cherry Tree on Kottler Dr. The run today was quite an experience. We started in a LARGE group. When there was a slight hill, you could see nothing but people running in front of you. When looking ahead, I though “I wonder how they run so close together” … then I looked around me. At times it was quite a challenge. We didn’t want to be rude and push people out of the way, so we just kept the pace with the people around us for most of the time, inching ahead whenever we had the opportunity. Some people were a little rude and pushed others out of their way as we ran, but luckily not to us. Wise decision on their part). We had to look for an open pocket, then weave through some people to get to it, then repeat this process. A few times we wound up in open pockets that were full of someone’s BO. We didn’t stay there too long. We were on the jumbotron at one point. I started flailing my arms in the air when I realized this. When we reached the end of our leg, we forgot that we agreed to meet our teammates on the right side of the street, so it took us a few minutes to meet them. They handed us our clothes and took off. Just at this time, my knee started to malfunction. Luckily, my knee waited until my leg of the race was over to start complaining. I’ll just take extra glucosamine chondroitin today. I usually take one of these vitamin a day as it is supposed to help joint pain. It’s proven to help people with arthritis, but I heard that it is good for runners too from my friend Meghan. Our time for the 16.1km was 1:29:16. I would have liked to do it a bit faster, but I wasn’t used to running in such a big group. We were running side-by-side for most of the run, but maybe the better strategy would have been one after the other. Tomorrow is the Vienna City Marathon. I am running in the relay as a member of team “IST Austria 2”. (You can even look me up on the marathon website!) Morten and I decided to go for a short run yesterday, nothing too long since we would have to run 16 km in the race 2 days later. We decided to run for 30 min, then head back to IST. We figured that we would be gone for at most one hour. We continued our run on one of my favorite paths in the woods over here. We ran along a stream, on a narrow pathway. The course winds back and forth a couple of times. In general, it just feels good to be running along the path there. Well … unless you accidentally slip on the rock and fall (there is a bit of a cliff at one point). Then, we made it to the road. Instead of turning around, we ran down into St. Andrä. There was a small path that brought us down to the small town. Again, instead of making a 180 turn and going back the way we know, I asked Morten how adventurous he was (with about 1 hour of daylight remaining). So, we attempted to forge the forest. We ran into the next town of Wördem (which is probably just a part of St. Andrä). Then, I saw a path that led us into the woods. Morten looked like he was a little worried, then he told me “this hill looks like it has an exponential increase. We will never make it to the top.” I told him we can find a way. We get half way up, and then we see a sign for “private property”. Since we were on a road but not in a car, we decided that this sign is probably intended for drivers not joggers. So, we continued. Luckily, before we would up in someone’s back yard, we saw a farm and ran around it and back into the woods. From there, we followed our “sense of direction” which eventually brought us back to the main road back in Klosterneuburg. The problem was that we didn’t recognize it when we reached it. We took a good ten minutes debating which direction to go. Then, we realized that we made it back to Klosterneuburg (well, almost), and we were on our way. So, what do we do? We enter back into the forest. This time, we go up through the woods, then back down to the road again because it was starting to get dark. In the end, we made it back alive. And, I only had one wound that was bleeding (and only a little bit). I’d say that’s a pretty successful run. Now, wish us luck for tomorrow! The hardest part will be getting up and remembering everything to get onto the 07:12 bus tomorrow. yikes! I mapped our run on walkjogrun.net as best as I could. The paths (especially the ones in the woods) are approximate, but pretty close to what we actually ran. Just 30 mins out … and the return. TurboTax sent me a text message as I am writing this blog post: “Great news, Brittany Terese Fasy! Your federal return was accepted by the IRS. Check your email for a confirmation message.” My question is: Why does this warrant a text message? If it was really great news, I should be partially shocked by the fact that they accepted it, but I am not. I filled everything out correctly (and Turbo Tax double checked my return for me), so why would it not be accepted? Maybe I should have been fearful of the possibility of my tax return being rejected. On a related note, Dave send me this link for a petition that I encourage you to sign. It is a petition to have grad student and post doc stipends not taxed. (I wish they had that in Europe, as I pay very high taxes here on my salary). I was number 3,187 to sign this petition. It needs 25,000 signatures to be considered. Last time this petition went around, it missed the 25,000 mark by less than 3,000 people. So, your signature will make a difference! I signed this because I think it is worth consideration, especially the case for graduate students. Wir haben verschiedene Speisen bestellt. An beiden Abenden haben wir Suppe gegessen. Natürlich hatte David Frittatensuppe. Das ist Davids Lieblingssuppe. Die Gulaschsuppe war meine Lieblingssuppe. Als Hauptspeise haben wir am ersten Abend Jungrind, Hirsch, und Schweinsmedallions gegessen. Am zweiten Nacht hatten wir Hochzeitschnitzel, Spätzle mit Speck, Fleischpalatschinken, und Gröstle (ohne Spiegelei). Spätzle mit Speck ist nicht auf der Speisekarte, aber der Chef war so nett und er hat es gekocht! Wir wollten Nachtisch bestellen aber wir hatten keinen Hunger mehr. Das Essen war größer als unserer Bäuche! Beide Abende gab es Schnaps auf’s Haus. Ja, das Essen war lecker. Außerdem war das Service hervorragend. Beide Abende haben wir erst eine Stunde vorher reserviert, aber es gab keine Problem. Der Gasthof hat am spätesten geöffnet als andere Restaurants. Als unser Taxi nicht gekommen ist, hat die Kellnerin ein anderes bestellt. Der David hast sein Spätzle mit Speck! We ordered a variety of food. On both evenings, we started with soup. Naturally, David had the Frittatensuppe (pancake strip soup); this is his favorite soup. The Goulash soup was my favorite. On the first evening, our main courses were beef, deer and pork medallions. On the second night we had “wedding” schnitzel, Spätzle mit Speck (see photo), meat-crêpes, and Gröstle (a Tirolean potato dish with speck, mine was without the fried egg). Spätzle mit Speck was not on the menu, but the owner was so kind as to make it for us anyway. We would have ordered dessert, but we were no longer hungry when we finished our meals. The food was bigger than our bellies! At the end of the meal both nights, we were given schnaps from the house. 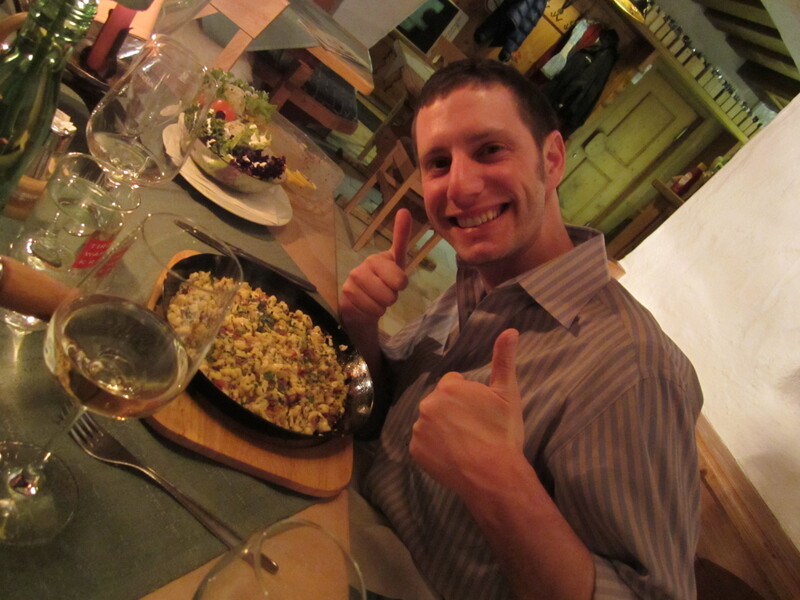 Overall, the food was delicious, and the service was excellent. Both evenings, we only reserved one hour in advance, but this was not a problem. The restaurant was open later than the other restaurants. On the second night, when our taxi did not come, the waitress ordered another one to bring us there. A few weeks ago I saw a livingsocial coupon for Re Pac Bags. After investigating them a bit, I thought it would be worth the investment. I paid about $10 for a $22 coupon. From Re-Pac Bags, I bought four bags for $27.80 and free shipping. I will do the math for you since some of you think I am getting a PhD in mathematics. Altogether I spent $17.80 for a large bag, two medium sized bags and a snack bag. So, why did I decide to buy these for David? We like to make our own lunches to bring into school, but we go through Tupperware like a washing machine loses socks. The big containers are good for when we travel with the food in them, but take up a lot of empty space on the way home and a tremendous amount of cabinet space. These bags take up little room, are easy to clean (can go either in the dishwasher or the laundry machine), and are environmentally friendly. I ordered the bags on 26 January, but did not receive them until 31 March. On 1 March, I sent an email to the company and received an immediate response from them letting me know the status of my order. Turns out that they did not expect the living social coupon to sell so well. When the bags finally arrived, Dave sent me the photo on this post. 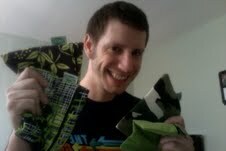 I think he was thrilled about the color of the bags– GREEN! Dave is testing out the Re Pac Bags while I am in Austria. We’ll see how they compare against Rubbermaid, Tupperware, and Ziploc. If they work out well, we will be buying a few more of them when we move to Pittsburgh in September!